A. Your teeth are like any other body part -subject to wear and tear on a daily basis….most people will see the effects of this “wear and tear” regardless of the amount time, effort or money spent on the care of their teeth. Most people accept age-related changes in life without guilt or blame (like the need to change eyeglass prescription and colorizing gray hair for example). Yet with teeth there is major guilt, shame or a need to find fault….”I shoulda…i coulda.,but couldnt afforda, …if only i hadda” ….unavoidable stuff just happens. It’s important to recognize the problem and to fix it quickly-.if you’re suffering from a toothache that means the immediate relief of pain and control of infection! The Dental Emergency Room is set up to do just that. Q. I have an abscessed tooth….doesn’t that mean you have to treat the infection first before you can take out the tooth??? A. 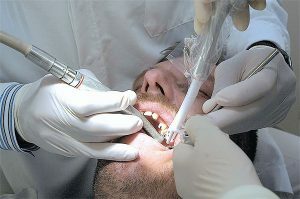 Not necessarily; The notion that you can not remove a bad tooth because it is infected. is not true in many cases ….this is a judgement call best left up to the oral surgeon…Usually its best to remove the source of an infection as soon as possible and treat the infection at the same time…its like baling out the water and fixing the hole in the boat. Q. I had a “root canal” in the tooth, so why does it hurt ??? Root canaled teeth can’t hurt because the nerve is gone…right ??? A. Not sooo….root canaled teeth tend to be brittle and are much more prone to fracture than “normal” or “live”teeth…They can crack or fracture at any time without warning through no fault of yours and infections can develop through vertical cracks. These cracks or fractures can go from the top of the tooth (crown) through the root and into the supporting bone. Root canaled teeth can also become infected through extra “lateral” canals that are often not seen on x-rays. Gum disease that travels along the side of the tooth can also be a source of infection for a root canaled tooth. Unfortunately, root canaled teeth are a common problem that we see in this office everyday. Q. What can I do to prevent dental emergency problems ?? A. Smile..Bad things happen to good teeth all the time for no real good reason. Often its just plain bad luck like breaking a tooth on a bone or seed…or a traumatic injury like a slip and fall or a “soft” ball to the mouth.. Many dental problems can be traced back to hereditary predisposition (“soft teeth” and impacted wisdom teeth for example). Don’t put candles on your birthday cake. Whatever the cause of your dental problem…urgent care is available everyday at the Dental ER.